I have two sets to showcase today focusing specifically on matching to the Quel'Dalar sword to two sets of gear. These sets weren't easy for me, and I really took a long time to get them together between finishing school, Diablo, and moping around my house. A while ago, when I sent out a "feeler tweet" for items people couldn't match to transmog sets, I got a request for something (from @WalknBullseye) to match the Quel'Dalar sword for a Death Knight. I looked at the sword and thought that it wouldn't be that hard, but this thing had me stumped for weeks. Without further ado, I present the first set to match Quel'Delar. This outfit is a mash up of a few sets from WoW. The Overlord's Plate set makes up two pieces and the Deathbone set makes up for the rest. I really liked the way that the Overlord pieces work with the Deathbone, and I think a tabard would really complement this set well. Any of the three tabards here would work well, though the Tabard of Brilliance isn't readily available in the game. Instead of a black and silver set, I came up with another angle to complement the sword of choice. 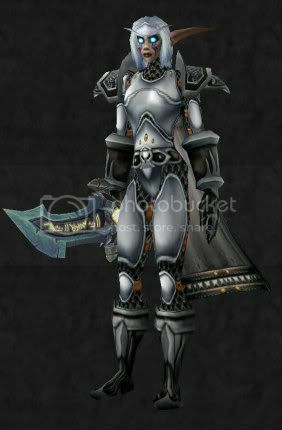 This set uses many of the pieces from the Righteous Armour set, with some pieces from the Battlegear of Valor Recolour. What do you think of these sets? Would you change anything about them? Do you have an item you just can't match?